(2015). Optimization of Fabric Layout by Using Imperialist Competitive Algorithm. Journal of Textiles and Polymers, 3(2), 55-63.
. "Optimization of Fabric Layout by Using Imperialist Competitive Algorithm". Journal of Textiles and Polymers, 3, 2, 2015, 55-63. (2015). 'Optimization of Fabric Layout by Using Imperialist Competitive Algorithm', Journal of Textiles and Polymers, 3(2), pp. 55-63. Optimization of Fabric Layout by Using Imperialist Competitive Algorithm. 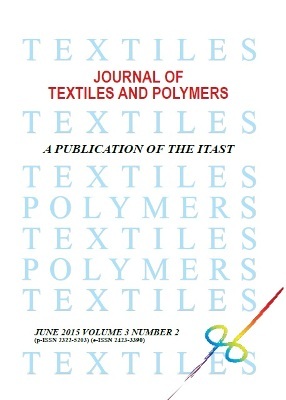 Journal of Textiles and Polymers, 2015; 3(2): 55-63. In textile industry, marker planning is one of the main operations in the cutting fabric stage. Marker packing is usually used to maximize cloth exploitation and minimize its waste. In this research, a method is used based on new found meta-heuristic imperialist competitive algorithm (ICA) and Bottom-Left-Fill Algorithm (BLF) to achieve optimal marker packing. Function of the proposed method was compared with other evolutionary algorithm based marker packing methods. The results indicate that the performance of presented method is 6.5% higher than other evolutionary marker packing methods.